Before I review FIFA 10, let me make this clear; if the editor goes through this and replaces every instance of ‘football’ with ‘soccer’, there will be transatlantic war! Secondly, do yourself a favour (I won’t even fix your spelling of "favor." -ED) and read this review before scrolling down and checking the scores. The history of Electronic Art’s FIFA series is well documented from endless rehashes to being continually outshone by Konami’s Pro Evolution Soccer. That all changed in 2008 when EA rehauled the game, including a superb new physics engine. Since then, year on year improvements have led to the gaming masterpiece FIFA 10. One FIFA’s eternal disappointments since the PS1 days has been that despite analogue sticks, player control has been an eight-way affair. This throwback to the d-pad days has been eradicated, and the game feels so much better for it. Movement of both players and the ball feels subtler, allowing for a deft level of simulation never seen before. 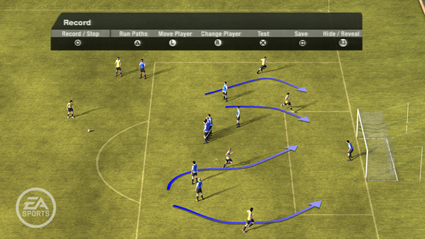 The increased simulation improves the speed of players and the way the ball pings about the pitch. Players feel ‘bigger,’ meaning shorter passes and more vital use of space, especially around the box. Punting the ball forward is much less fruitful. All of this results in an environment where players must work hard for goals – seeing the ball ripple the back of the net has never felt so satisfying. Players feel more physically correct than before. Whether it be a player’s speed, height, or weight, all the characteristics feel relevant in any given situation from forcing a man off the ball to heading a looping cross under pressure. This means selecting a balanced team is much more important and tricky – physicality becomes an imperative consideration both offensively and defensively. These changes mean that guys like Chelsea’s Didier Drogba are far better target men than someone like Manchester United’s Michael Owen. The flow of play is also much smoother due to simple tweaks to game play mechanics. Quick free kicks can be taken in certain situations, and the referee is more likely to play advantage for players in the middle of an attack. He’s also more lenient when it comes to dishing out yellow and red cards. 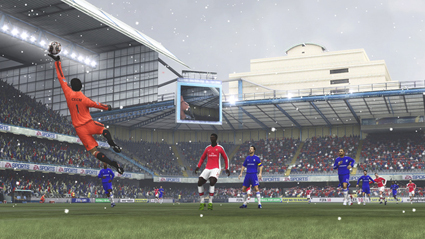 FIFA 10 looks stunning. The players from the big teams look as close as they ever have to their real counterparts, and playing the game feels like controlling a live match on TV. Ryan Giggs’ prominent Welsh nose and curly locks have never been recreated so perfectly. Stadia are similarly intricately detailed – even down to the stripes mowed onto the pitch. Unfortunately, the player model detail in the lesser leagues leaves a bit to be desired. I find the acid test for a football game’s graphics is the effort invested in the crowd. They are as good as anything previous, but there is still room for improvement in FIFA 11. Virtual Pro is the new mode to FIFA 10. This builds upon the already established Be A Pro mode but with some important changes. Players design a character as before, but can now use EA’s Game Face service to put their beautiful features directly onto a footballing avatar. 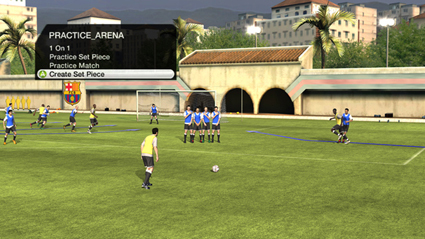 Once completed, the player is available in any game mode – both on and offline. The game constantly rewards players for spending time with their creations. Martin Tyler and Andy Gray once again provide commentary that reduces repetition from previous years. There is plenty of pre-recorded rambling, and sentences like "Player A passes the ball to Player B" are less stilted or jarring than in previous incarnations. The game still has some minor bugs. The most annoying of which is a throwback to last year’s title where online Head To Head matches don’t connect properly, leaving the player to go back to the main menu and start the process over again. Interestingly, I never hit this problem when joining a team match. FIFA 10 isn’t perfect, but it’s a new benchmark in sport video games, let alone one based on football. It accomplishes more than any other football game, and is as significant as Sensible Soccer all those years ago. FIFA 10 is a phenomenal achievement, and the greatest football game ever made.